Dubai: The Roads and Transport Authority (RTA) has officially launched the official operation of the Jebel Ali Bus Depot; the latest addition to bus terminals intended to support daily bus movement. It joins up with the already completed Al Khawaneej, Al Ruwiyyah and Al Awir Bus Depots. The new station serves 17 bus routes covering the daily bus movement in the neighbourhood of the station. Mattar Al Tayer, Chairman of the Board and Executive Director of the (RTA), opened the depot accompanied by the CEO of RTA Public Transport Agency Eisa Abdul Rahman Al Dosari. Al Tayer made an inspection tour of the station to ensure its operational readiness where all employees, engineers and technicians have been deployed in their respective jobs at site. During the tour, Al Tayer was briefed about the components of the station which comprises in the first stage the construction of the external boundary wall of the site, internal roads, bus parking yard, workshops, and public utility networks (water, electricity and sewage). The station has a capacity to house about 300 buses (standard, articulated and double-deckers) and is fitted with 24 bays capable of handling 36 buses at a time to carry out a range of works such as bus washing, cleaning and refueling. The Depot has an office compound to house about 50 staff as well as a residential complex to accommodate about 300 drivers which is currently being constructed and is set for completion next September. “The project is part of RTA’s Master Plan to upgrade mass transportation by buses with the aim of attracting new commuters and hence contributing to easing road congestions. These highly sophisticated buses feature top of the range specifications, affordable fare and wide geographical coverage, and as such provide a big boost to the integration of mass transit modes spanning public buses, metro and marine modes. The Plan encompasses further expansion of air-conditioned bus shelters besides introduction of electronic systems such as the Journey Planner “Wojhati”, Automatic Bus Management Scheme, Unified Card Scheme, and Real Time Passenger Information System in addition to “Sharekni” and “Awselni” programs,” said Al Tayer. “Last May, four new service stations have been opened to support daily bus shuttling service; where on the first day of the month operation started in three bus stations; the first in Karama, with a capacity to house 10 parking buses, and is fitted with Nol card selling and recharging machines as well as bus route network maps. The Station has 2 routes serving the CBD in addition to city and inter-city services. The second station is Al Baraha Station; which can house up to 18 buses at a time and has 7 routes covering the surrounding areas. The third is Umm Al Ramool Station, which is located near Emirates Airlines Metro Station, and has a space for 12 parked buses, Nol card selling & recharging machines, and bus route network maps. The Station serves RTA buses designated to lift Emirates Airline’s employees and runs Awselni service and metro station feeder service in areas within the vicinity of the station. “In the mid of last May RTA operated Al Quoz Bus Station; which has a capacity to house 24 buses and is fitted with Nol card selling & recharging machines, and bus route network maps. 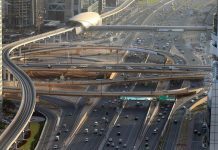 The Station serves seven bus routes including city service routes, metro stations feeder service, and local routes to serve Al Quoz area, and provides a link with the CBD in Deira and Bur Dubai as well as Al Ghusais and Satwa,” said Al Tayer.